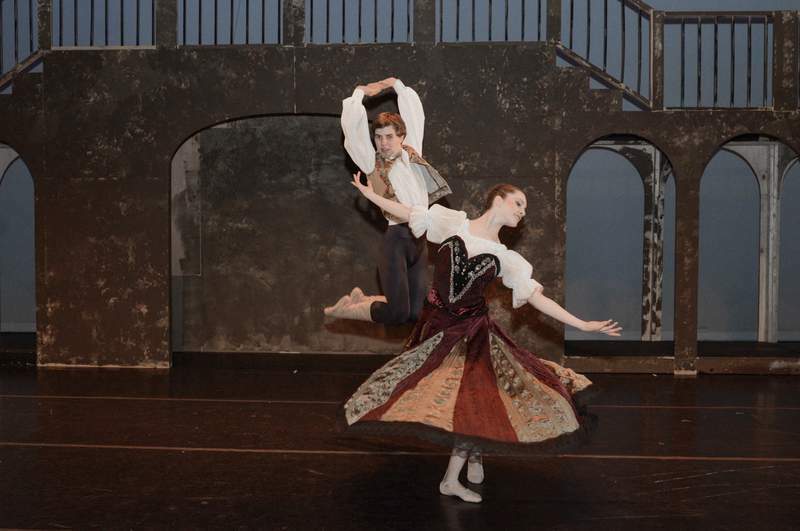 Michelle Davies | The Journal Gazette Caitlyn Quinn, playing Kitri, and Ernesto LeaPlace, playing Basillio, perform the grand pas de deux during their performance in Fort Wayne Ballet's production of Don Quixote, which opens Friday. Photos by Michelle Davies | The Journal Gazette During rehearsal for the Fort Wayne Ballet’s production of “Don Quixote,” David Ingram, left, playing Gamache, tosses a dowry to Phillip Colglazier, right, playing Lorenzo, while Gregory Manifold, playing Don Quixote, looks on. The show begins tonight, with two more shows Saturday. 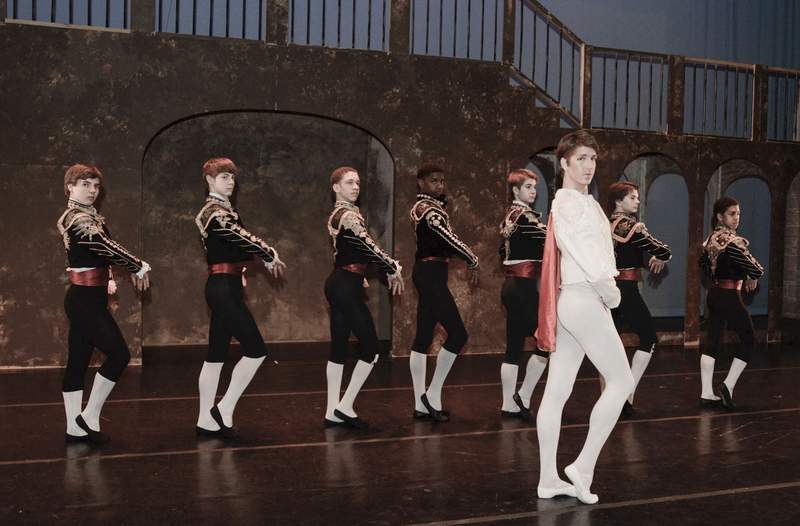 Michelle Davies | The Journal Gazette In the Fort Wayne Ballet's production of Don Quixote, Gavin Mark McNally, front, plays Espada, with the Torreadors behind him, from left to right, Talbot Rue, Jack Miller, Miles Nicholson, Carlos Jones, Sam Huberty, Isaac Hollis, and Kennon Nicholson. The production opens Friday. Michelle Davies | The Journal Gazette Talbot Rue, playing the Gypsy King, and Makayla Arnold, playing the Gypsy Queen, dance and frolic in their scene around a campfire in the Fort Wayne Ballet's production of Don Quixote, which opens Friday. Fort Wayne Ballet has never performed “Don Quixote” before, and with each passing rehearsal, the backdrop is layered by dancers, the dancers are layered by actors and the stage is layered by live musicians. Admittedly, the collaboration has left executive director Karen Gibbons-Brown a bit anxious. “But I’m anxious in a positive way. I’m anxious about pulling this together because we do have so many elements coming together on stage all at once,” she says. “But we have great volunteers and a great set designer and lighting designer. “It’s a fun ballet, and I had forgotten that because we haven’t had the opportunity to do something like this in my tenure here,” she adds. Opening today, the ballet “Don Quixote” is based on excerpts from the classic Spanish 1605 novel by Miguel de Cervantes with the Fort Wayne Philharmonic accompanying all of the weekend’s performances. There will also be a “Fiesta de la Vida” pre-show reception at 6:30 p.m. today and a “Explorer’s Retreat Party” following the matinée performance Saturday, where the audience will be able to meet the dancers and make a special craft. Gibbons-Brown says there is a noticeable difference for a dancer when he or she can feel the vibrations of live music, which is an advantage for this season’s final performance at Arts United Center. The company still has two performances left in May for the ArtsLab and Family series. 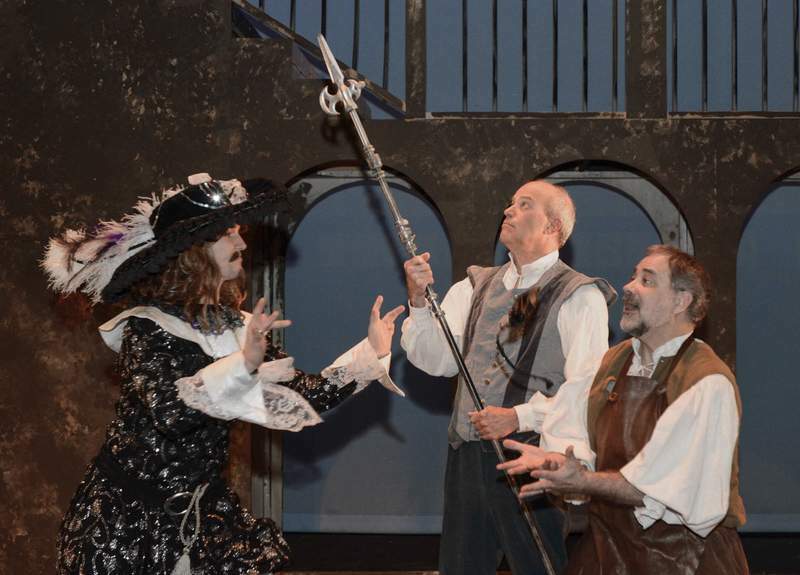 Don Quixote, an old knight portrayed by actor Gregory Manifold, is on a quest to save the fictional fair lady he has visions of in his dreams, when he encounters young lovers Kitri and Basilio. With Kitri’s father determined to marry his daughter to the wealthy Gamache, a love triangle forms with Don Quixote eventually deciding to trick Kitri’s father into giving the couple his blessing. The cast includes Civic Theatre executive director Phillip Colglazier as Kitri’s father, Lorenzo, and Fort Wayne Ballet artistic associate David Ingram as Gamache. For Manifold, who says that he hasn’t been as active in the theater over the past 10 to 20 years, being back onstage is one thing, whereas being an actor without dialogue is another. “I’m used to being an actor who has words,” he says, laughing. “All of the sudden I’m up on this stage with no words to speak, and it’s a very different feeling. Gibbons-Brown says the show’s relatable characters make it palatable for any age. “It’s really one of those very fun ballets that is family-friendly and the story is cute and the characters are very personable,” Gibbons-Brown says. Despite the lack of words, Manifold believes the movement and music seem to fill in the gaps. Gibbons-Brown says “Don Quixote” is just one effort to present ballets that may not be as recognizable to viewers.